SNOWDON ROCKS V – GREEN FOR THE DAY…………. 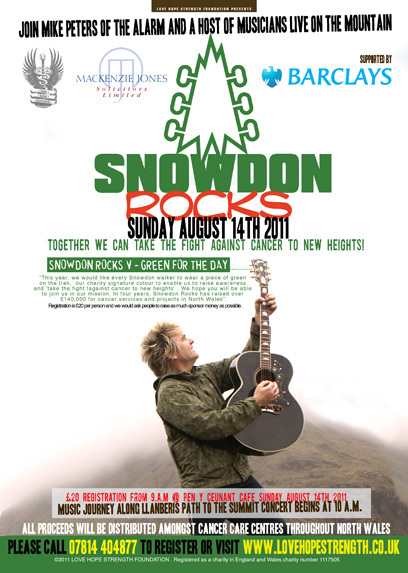 Snowdon Rocks V took place on Sunday, 14 August 2011 hosted by Mike Peters, co-founder of Love Hope Strength Foundation and lead singer of The Alarm. This year, walkers were asked to wear a piece of green on the trek, our charity signature colour to enable us to raise awareness and ‘take the fight to cancer to new heights’ and many people joined for this amazing event. Snowdon Rocks V featured a fundraising trek to the Snowdon summit following the Llanberis/Railway Path with intimate performances along the way from Mike Peters and LHS supporter and fellow Welsh musician, Chris Summerill. Click here to see the Snowdon Rocks 5 photos in a seperate browser window.